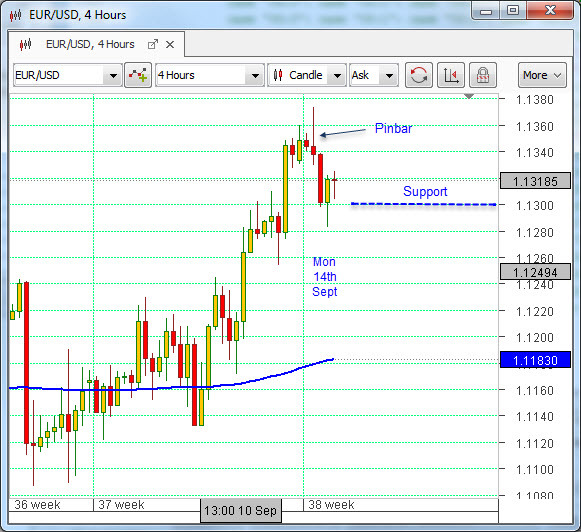 After climbing steadily since the middle of last week, the EURUSD pair took something of a breather yesterday. The Single Currency went into reverse, but only as far as the nice round number of 1.1300. The exchange rate actually dropped below this level for a while, but then buying pressure came back with such force as to propel it above this support level one again. Both the top and bottom of yesterday’s trading were marked on the four hour chart by what are known in Technical Analysis (TA) as pinbars. The one at the start of the day is quite pronounced. A pinbar is defined as a price bar that is composed of a short body at one end and a tail that is long relative to the overall size of the bar. In TA, the idea is that this tail represents rejection by the market of the direction, either long or short, in which it points. Aficionados regard a pinbar on the four-hour chart to be of particular significance. The rectangle between the open and close (the body of the bar) in this case is red, which means that it was a falling price bar. If it were coloured green, it would be a rising bar, and the open and close locations would be reversed. The tail in this case (read in conjunction with the colour of the body of the bar) indicated that the next movement after the bar had completed was likely to be downward. And so it proved after the start of yesterday’s trading. The pinbar that was formed then seems to have had good predictive power. As mentioned, and looking again at the chart at the top, it will be seen that the green bar that was formed at the end of the trading day was also a pinbar, although not so well formed. It came into being when price was brought back to the support level of 1.1300. It will be interesting to see if this bar has the same ability to predict the exchange rate movement as its counterpart above. If it has, the pair will rise today. The report that is likely to have most impact on the US dollar today is the one showing US retail sales for last month. This is closely watched by the markets and has the ability to move the EURUSD pair strongly. It is to be expected that it could have a larger than normal impact on this occasion, particularly if the figures are good, in light of the FOMC two-day meeting which starts tomorrow, and which could conceivably result in the first interest rate rise in the US in ten years.